As has been the case in previous years, 2015-16 O-Pee-Chee Hockey again offers options that are not found on the final checklist. So far this includes Woodies, a rare wood-themed insert, and Blank Back versions of the Retro cards. View full details on the unexpected inserts below. Like some of the flagship releases from Topps, 2015-16 O-Pee-Chee is geared more to the low-end side of hockey collecting. However, this does not mean there are not some appealing designs or rare hits to be found. Part of a ongoing tradition from OPC, there are also some unexpected finds for collectors in the product. 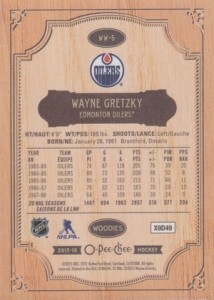 Shop for 2015-16 OPC Woodies cards on eBay. 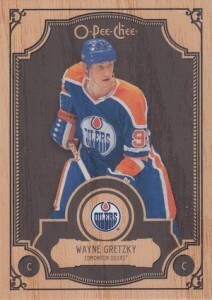 Woodies were the first to surface and much easier to keep track of since the insert line was noted on the back. The overall design is very striking, with a classic look and wood-themed design. Although the actual odds are not known, the unique inserts appear to be fairly rare and only average one for every few cases. The checklist is being compiled as the cards pop up. Feel free to let us know if you come across any that we don't have listed. Also, similar to 2014, Blank Backs of the Retro cards have also started showing up online. Check back for more information on 2015-16 OPC as it comes to light. The following checklist is a work in progress. Confirmed cards are listed below. Pulled ww9 Eric Staal just so u know. Shawn Shurtleff, Moe � Thanks!